Get into the spirit of track season! This fitting poem about the Saratoga Race Course will get your heart racing in anticipation for the upcoming season. Check out 'Twas The Night Before Track Season and prepare for a full season of fun at the Saratoga Racetrack! 'Twas the night before track season when all through the town, Hats off saratoga, joy is abound. The chairs were all packed in cars with care, in hopes that a picnic table soon would be theirs. Everyone was nestled all snug in their beds while visions of trifectas danced in their heads. And mamma in her sundress and I in my hat had just settled the checking account for a long day at the track. Now 7 am, there arose a big clatter. I sprang from the line to run for the matter. Away through the gate I flew like a flash, pushed the person in front and never looked back. The table all ready and some bottles of wine, set the day up for what would sure be a good time. When what to my wondering eyes should appear, a win place show with the loudest of cheer!!!! On Hattie's , on Shake Shack, on Pizza on Wheels. It's hard trying to pick where we eat all our meals. I heard them exclaim as they all left the track "What a great day at the races, now lets go to SPAC". 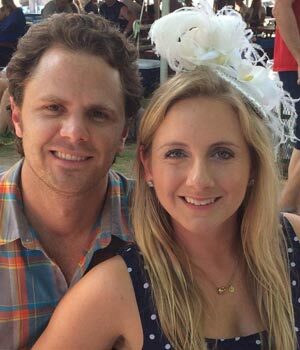 Photo of the poem author, Tim Tobin accompanied by his wife Lauren at the Saratoga Race Course.